Ob Nixilis is having a bad day. Things had been going so well. He'd seized the power of the relocated Khalni Heart, and with it forged a connection to the raw mana of Zendikar. 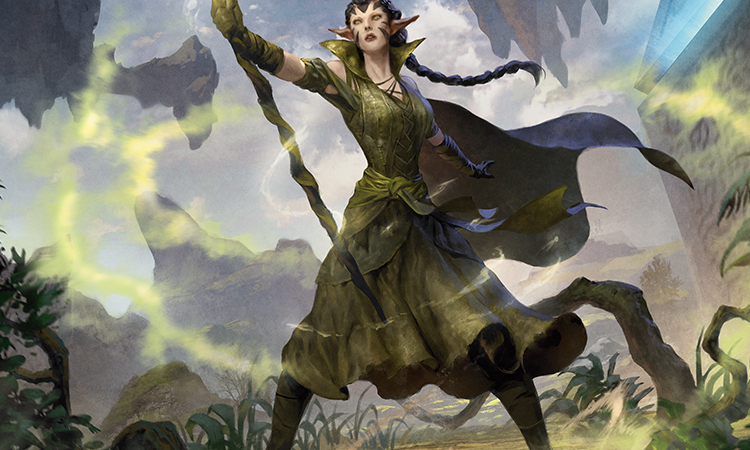 He was finally ready to tap into Zendikar's hedron network and restore his Planeswalker spark—and then disaster struck, in the form of the elf Planeswalker Nissa Revane. 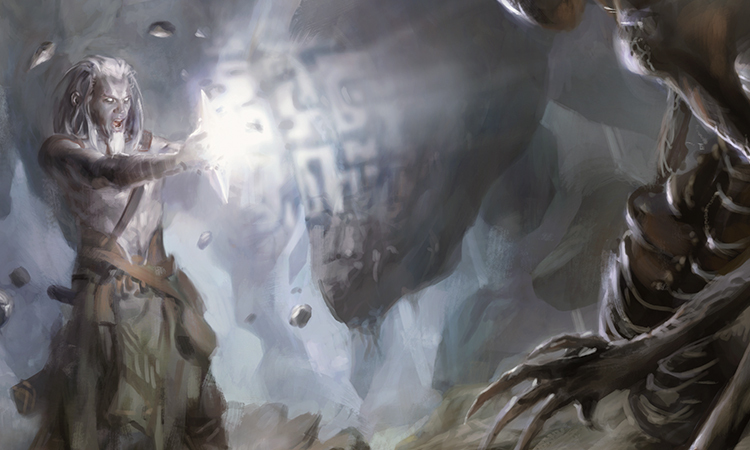 Nissa took Khalni Heart from the demon would-be Planeswalker, repaired her own connection with Zendikar, and collapsed tons of rock and soil on him. It was a setback. But Ob Nixilis had not gotten this far by giving up. A modest upgrade to the oblivion I had been expecting. It could only mean one thing. I laughed. Nothing else to do, really. My body was broken in a dozen places by the collapse of the cavern, and I was thoroughly pinned in place. The act of laughing sent waves of radiant agony throughout my body, and I used the pain to diagnose my injuries. They were severe, but I would heal. I was breathing. That was nice. Shallow, pained breaths, with stone and sand pressing down on me from above, but I was clearly getting enough fresh air to keep me conscious. That implied that I wasn't that far from the surface. Or perhaps I was just near enough to an air pocket that would run out soon. None of the options were terribly good. But I was alive. Defeat, if you survive it, should mean time for reflection. Unearned arrogance has been the death of countless would-be warlords. After all, how many did I cut down for their hubris over the millennia? Here, buried alive, on the heels of a crushing loss, I decided I would take the opportunity I had been given. It had been a very good plan. Synchronize a hedron network with Khalni Heart, and use it to channel enough planar energy through my body to reignite my spark. There had been a decent chance it would have killed me, yes, but I was well past that being a concern by now. 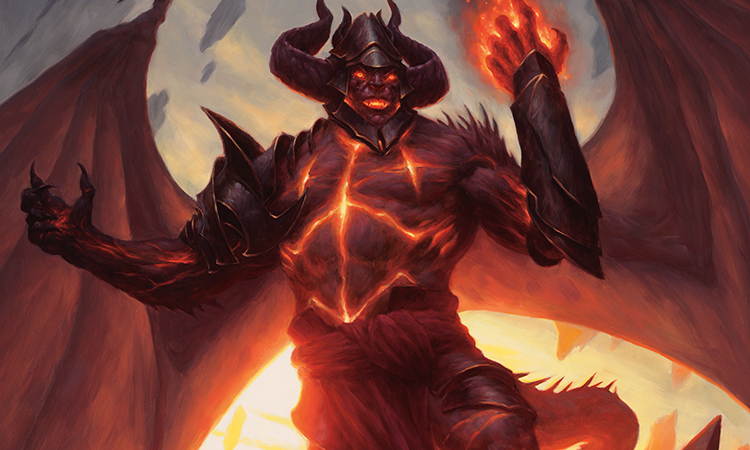 And yes, I knew that as of some decades ago, being a Planeswalker didn't mean what it used to. So much the better, really. The idea that there were countless planes out there that had lost their godlike protectors and champions! Imagine the chaos that the Mending had wrought on the Multiverse! Chaos like that needs to be quelled. Chaos like that needs to be brought to heel, and I am the perfect person for the task. The plan was good, but the plan had failed. The idea that some Planeswalker other than Nahiri would actually want to save this horrible plane had really not factored highly into my thought process. I had contingencies in place for her, but I admit I wasn't prepared for an insane Joraga who could draw upon the heart of a dying world showing up hours before my ritual would have been complete, upending a century's worth of work, and burying me alive. There was a bigger problem, and it was that all of my troops were in one valley, so to speak. I didn't know how long Zendikar had before the Eldrazi would finish destroying the plane, and even accounting for what I had learned, I didn't have another half-century to recreate my work. At the rate things were progressing, the plane would be irreparably broken within the year. Not to mention that there wasn't another power source like Khalni Heart left on the plane. Well, there was one. But even I wasn't that desperate. Not yet. I ran down my options. Option one: I try to replicate my work. Complication: The Eldrazi will almost certainly destroy the plane, with me on it, long before I succeed. Maybe I'd get extraordinarily lucky, and stumble upon another power source, but only fools plan on luck, and I didn't intend to start now. Option two: I go after the elf, and take the Heart back. 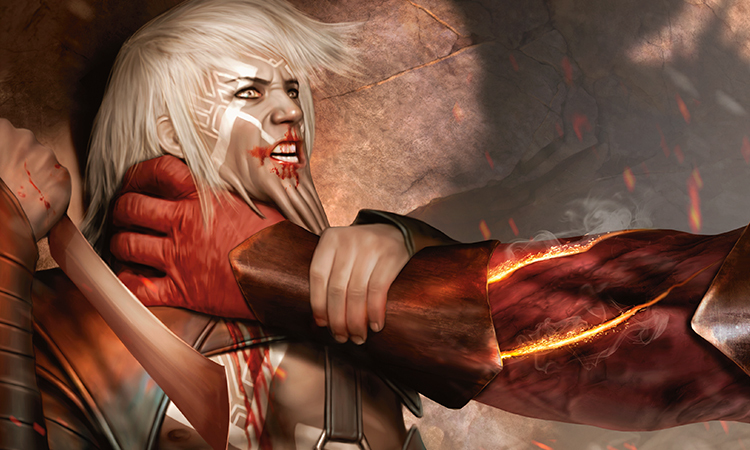 Complication: Taking on a Planeswalker in my current state seems like pretty poor odds, especially one who has Khalni Heart at her disposal. Especially one who already handed me a defeat when I was at full strength. There's no honor or dignity in a futile charge against a superior foe, despite what I may have told a general or two whom I needed to do the tactically expedient thing. Option three: Team up with a greater power. Oh, it's never my first choice, but sometimes it's the only way. I had studied the Eldrazi almost as thoroughly as I had studied the hedrons. While they couldn't be bargained with, they had shown themselves willing to work through allies—old Kalitas learned that the hard way—and I would certainly relish helping them bring this world to ashes and end. But then what? They have no sense of gratitude, no sense of fairness. The idea that they would reward me in any way would be impossibly alien to them. A pyrrhic victory is merely the most palatable kind of defeat. Time. I needed more time! The solution hit me, and I laughed again. Uproarious, oblivious to the pain. I laughed until I wept molten tears. After all these centuries, nothing amuses me like irony. There was exactly one way that I could buy myself enough time to recreate my work. I was going to have to save Zendikar. First things first. Buried alive. I wasn't sure precisely how much time had passed. I was far from healed, but when you're counting down to the end of the world, you can cut corners sometimes. I reached out to the area around me and attempted to extinguish the nearby life, drawing the energy for myself. A simple feat of magic, and somewhat of a specialty. But when I reached out... nothing. I was buried in Bala Ged, a place stripped of all life by Ulamog. There wasn't even an insect, a worm, a blade of grass to drain for strength. This time, I found the irony less amusing. I struggled for what must have been hours before I finally managed to shift the stones above me. While doing so, I imagined a thousand pleasing ways to end the elf's miserable existence. The entire process of escape took days. A handful of the ideas held promise. From there, the next step was to excavate what I could of my hedron network. Even with a bare handful of hedrons, I could effectively construct a leyline "compass"—something that would give me a sense of the distribution of energy on what was left of the plane. If there was going to be a defense of Zendikar, the Joraga would be at the center of it, drawing on the power of Khalni Heart, and that was something I could track. The work was slow, and it gave me plenty of time to think. Ulamog's spawn were an unrelenting, unthinking force, and the various monstrosities that commanded them wielded sheer power of the sort that I had rarely seen. Still, it was the unthinking aspect of their nature that provided the opportunity. All it would take would be a properly coordinated force of sufficient might and an insufficient sense of self-preservation to give me an opportunity to strike at the head. I was sure the Zendikari were busy scrounging up such a force, even if I had no intention of leading it. The titans had been trapped for a very long time, and they could be contained again; I didn't need them destroyed, or even permanently incapacitated. Quite the contrary—I was more than pleased to give the monsters the feast they deserved. I just didn't intend to be a course. I had spent quite some time deciphering exactly what Nahiri had done to me. And now I was going to do the same thing to Ulamog: use a hedron to bind an extraplanar threat, and save Zendikar. I wondered if Nahiri would be pleased or disgusted that I was the one doing her work for her now. I found both options hilarious. I clawed through the dust for more than a day before I found what I was looking for: a hedron no larger than my head, intricately carved, and alive with power. It was the keystone in the hedron network I had created—just the thing to use to bind Ulamog and diminish its power. I looked upon it again with some amount of awe. There was room in my loathing of Nahiri to admire her genius. To create something of such power, and contain that power in an object that could survive for millennia or more! If Nahiri had not returned to help forestall Zendikar's destruction, it almost certainly meant she was dead. It made me a little sad, truly, that I would never get the chance to face her again. Well. That had been enough sentiment to last me another decade. Or, more likely, for the rest of my life. I ran a pulse of magic through two of the larger hedrons in my network, and they floated up above the sand, turning themselves slowly until they found alignment. From there, I activated the keystone and moved it slowly around the pair, feeling the push and pull of energy from the stones. Lithomancy was a subtle art, and though I knew I had only scratched the surface of it, it still offered me a versatility of magic that I had not known before. The basic function of a hedron is to redirect energy—but that simple function can be used to empower, summon, imprison, or destroy. An image of weight, of gravity and distance, played out in my mind and body, and I strained to make sense of it. The location of the elf was easy enough to divine; empowered by the Heart, she stood out like the sun. But there was something else, a channeling of mana that seemed both abhorrent and familiar. They were close together; whatever it was, it was likely where the Zendikari would make their last stand. Tazeem. Sea Gate, if memory served. A lovely place for a slaughter. Marvelous things, really, and I hadn't made much use of them. They made travel slightly more bearable, and made moving between Zendikar's continents much less of a chore. The skies offered a taste of freedom, but also served as a bitter reminder of what I had lost. The freedom of the skies is a vanishing mote of dust in the face of the freedom that the Multiverse once offered me. On the other hand, you don't see a lot of demons on boats, and it turns out there are some very good reasons for that. I flew along the coasts, preferring to avoid flying over open water, except as needed to reach Tazeem. The skies were largely devoid of life. With a keen eye, you could pick out some of Ulamog's floating spawn, but they were uninterested in me, and I in them. Birds were rare. Angels, thankfully, were all but gone. 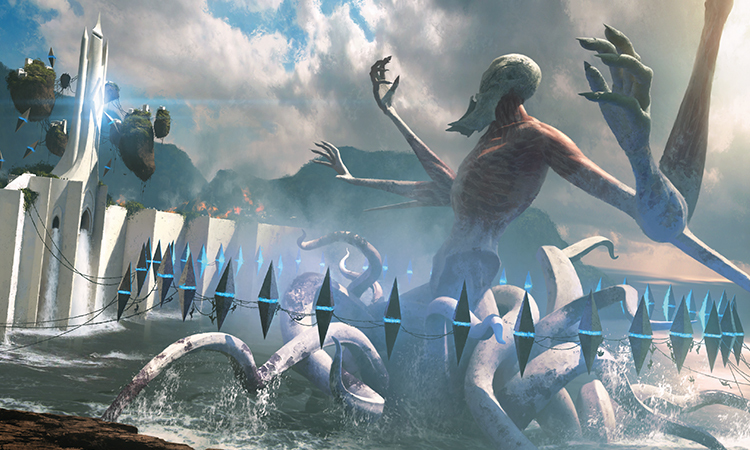 When the Eldrazi rose, the angels fought. Adorable, really. Not awful tacticians, if I'm being fair, but they labored under the misconception that it was a battle that they could win. The angels fought, and mostly, they died. Very rarely, you'd see one of Emrakul's lone spawn floating about, doing whatever her spawn do. But for the most part, the skies were mine. An open sky, a bright sun shining down on me, peaceful clouds drifting in the wind. And I felt them all as an oppressive weight, a confinement—that distant horizon was a claustrophobic nightmare. But soon that horizon would be gone. And one way or another, so would I. As I covered the miles on my approach to Sea Gate, it was clear that I was heading to the right place. On one side, there were endless wastes—Ulamog himself had carved a path to this place, leaving silence and dust in his wake. On the other, a ragged supply caravan wound its way through Tazeem. Refugees and fighters (though you couldn't really tell the difference between them) were swarming to the wall; the last stand of Zendikar was already underway. I could hear the roar of battle from miles away. Such a beautiful thing. But it was nothing compared to what I saw when I crested the wall. Armies clashing, spawn and Zendikari slaughtered by the thousands, and rising above it all, Ulamog. Trapped. In an enormous hedron network. I needed a moment to take it all in. I couldn't keep the grin off my face. The network was huge. The Zendikari had accomplished with brute force what had taken me decades to complete through care and subtlety. By using the gigantic, structural hedrons, they were able to tap into the energy of the entire plane—my work with Khalni Heart was essentially a scale model of what they had done. The alignment was rough and amateurish, even by my dabbler's standards, but it was stable. Only a fool plans on luck, but it is a greater fool who fails to take advantage of it. Option one was back on the table. I found a good vantage point to study the network, gently displacing the kor sentries who had been using it as a lookout station. The network was straining to contain Ulamog, but the titan was starting to weaken as well. I was impressed. The Zendikari might have actually been able to kill it. Full marks for effort and inventiveness. But it was time to add a minor wrinkle to that plan. I flew up, high up above the fray. Kor on their kitesails spotted me at this point, but didn't engage—their attention was focused on holding back the spawn and relaying information to the battle below. The keystone hedron trailed behind me, and it began to react to the network's incredible energy. Its runes glowed with a violent light, overwhelmed by the leyline flow. I willed it into place, locked it into a harmonic point above the ring's precise center. It began to spin, a vortex of energy forming that sent a numbing electrical charge throughout my body. I faltered in the sky for a moment—my heart was pounding, and I could scarcely breathe. I had waited so long for this. So very long. In that moment, everything began anew. The energy overwhelmed my senses: My vision flared to white, and I couldn't sense my body. The power burned through me, a rushing torrent of agony and perfection, and deep within my core, first as a glimmer, and then as a blazing flame, my spark. My spark returned. No. I wasn't done here. Not yet. I tore myself out of the mana stream, power coursing through me. A snap of my fingers, and one of the structural hedrons fell out of alignment. The sheer force of the leylines held it in place for a moment longer, but then, achingly slowly, it tumbled to the world below. There were screams of terror and disbelief; Ulamog thrashed, and the rest of the network crumbled. And down, so far down below me, I caught sight of her. The little elf. She had to know what was happening, she had to have felt it in her bones. Yes. There. She looked up at me, a look composed of shock and utter, utter despair. That was a nice start. But I was far from done. One by one, I felt my connections to my old conquered worlds reappear. Not all of them, but enough. It had been so long. 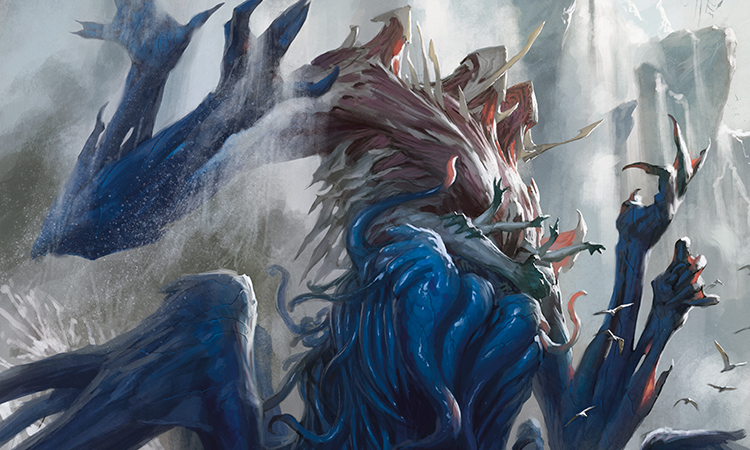 I let loose an enormous bolt of withering annihilation into the armies below, cutting off their retreat and forcing them back into Ulamog's path. The Zendikari were dying, hundreds each second, and I could taste each life as it was snuffed out—crisp, juicy, and sweet. A pocket of order was forming in the ranks below. A few Planeswalkers were desperately trying to organize a retreat, not that there was anywhere meaningful for them to go. Head swimming with power, I wanted nothing more than to swoop down there and end them all—and I would—but I caught myself. Not yet. Not yet. There was one last thing I needed to do first. Deep beneath the surface, it was already beginning to stir. I whispered to it, heedless of distance. I dared not focus my mind too directly on it—reality recoiled and splintered merely from my thoughts approaching. But the power was there, and power spoke to power. It did not have a consciousness, not in any sense I could describe, but it had a will, and that will wanted nothing more than to be given purpose. I laughed. I had not felt joy like this before, not ever. No triumph, no glory was greater than this. Beings of power... beings of power want to be called! With my spark reignited, it was the easiest thing in the world. One more word. One little word was all it took. The world shook as I said it. The doom of Zendikar was here at last. I reached out to the south and grasped it. Awakened it fully with the sheer force of my will. Mine would be the last word for this wretched plane, and I shouted it from the center of my soul.